First Residential College, also known as Asrama Tuanku Abdul Rahman (ASTAR), is proudly entitled as the oldest residential college in University of Malaya. 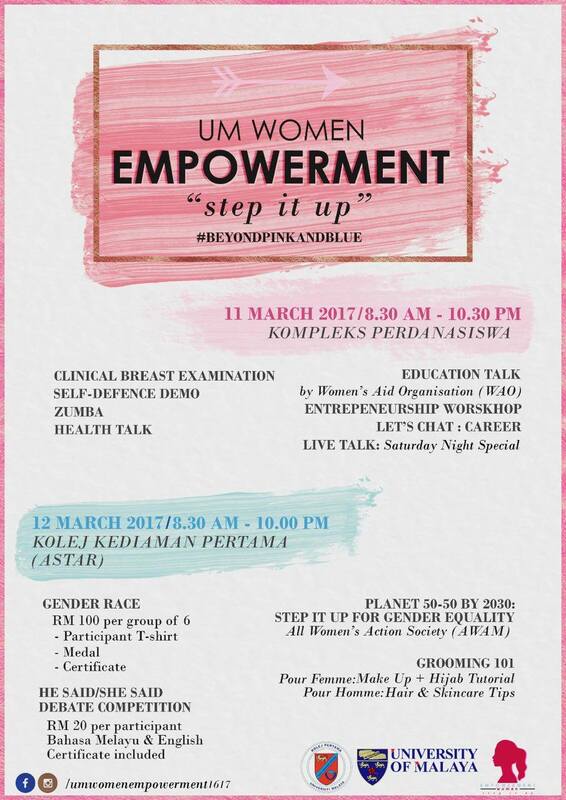 Along with ASTAR’s long establishment, here comes the 2nd University Malaya’s Women Empowerment (UMWE) event in concordance with its latest success last year. UMWE is a two days program, which will begin on the 11th of March 2017 and end on the 12th of March 2017. This program aims to shape independent, literate, charismatic, and holistic women. This program not only promotes empowering of women but it also intends to tackle the gender based issues faced by women globally. In addition to that, this event promotes gender equality and the importance of this issue. This program will be conducted at the national level and both female and male students will participate actively as we strongly believe that education and opportunities should never be restricted to anyone. 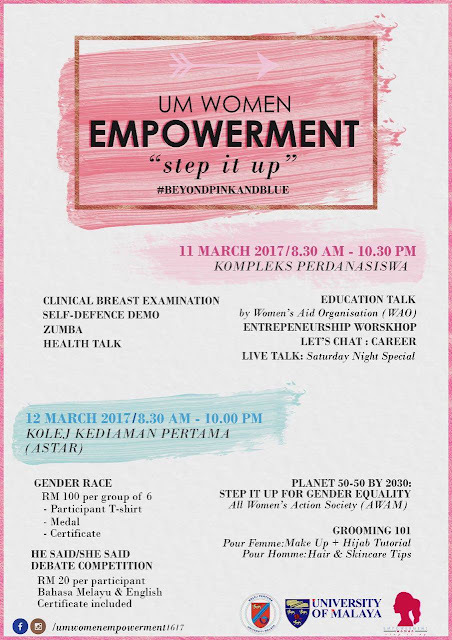 Our theme for this year is "STEP IT UP FOR GENDER EQUALITY!" as we believe full commitments from both national governments and society is a must in monitoring and empowering women and youth as a whole. When it comes to fun and practical workshops entertainment everything is possible as we provide training workshops which focuses on an overview of core gender concepts and dealing with gender stereotypes and issues. And not only that, we offer amazing games and entertainment for participants. UMWE 16/17 will be holding all sorts of events, ranging from gender race and even debates for all to experience. The highlight of our event would however be the Planet 50-50 by 2030-STEP IT UP FOR GENDER EQUALITY, which will be attended by the All Women’s Action Society (AWAM). Many key speakers will be all the important details.